A mortgage is possibly the largest financial commitment an average person will make and can often last for the majority of a lifetime. It is understandable that this is a bitter pill to swallow with the knowledge that you'll be paying off a single debt for the majority of your life. Mortgage Overpayments provide a means to clear your mortgage debt sooner than expected and save a fortune in over the long term. Overpaying a mortgage can allow you to save almost twice as much as you pay. An overpayment is an unscheduled payment on a mortgage to reduce the capital balance. In essence this means paying an optional extra amount to what has been agreed by your lender. Overpayments can be as frequent or infrequent as you like and can be any amount. Two typical examples of overpayments are lump sum overpayments (e.g. a large sum from inheritance or employment bonus) or regular monthly overpayments (e.g. £100 extra per month - see example below). Most lenders will have a maximum amount of permitted overpayments on a mortgage in any given year which is usually about 10% of the remaining mortgage balance. It is recommended you try to anticipate how much you would be able to overpay and ensure this limit meets your needs as if you were to overpay beyond this permitted limit, it is likely that the lender would charge an Early Redemption Charge on the amount you go over. If you have a £200,000 mortgage with an early redemption charge of 3% that allows overpayments of 10% in any given year, an overpayment of £30,000 would mean an early redemption charge of £300 (£10,000 x 3% = £300). There are also some lenders and mortgage products that will allow unlimited overpayments such as flexible mortgages. With these mortgages, you can overpay by any amount as long as the mortgage is not repaid in full. An added benefit of some flexible mortgages is that you can draw out ('redraw') your overpayments should you ever need the funds back. In some instances, you can choose not to reduce the term of your mortgage but instead keep this the same and have your regular monthly repayments reduced. This is usually available for lump sum overpayments instead of smaller regular ones due to the administration involved in recalculating your mortgage. The benefits of overpaying your mortgage can be enormous and often have greater impact than offset mortgages as capital reduces at a faster rate. 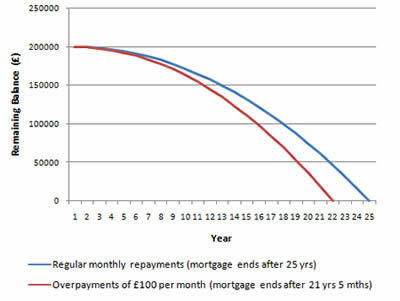 The graph below shows the effect of overpaying a 25 year £200,000 mortgage by just £100 per month. In this instance, the mortgage would end 3 years 7 months sooner and would save you a massive £28,050.63 over the course of the mortgage. To see how much you could save by overpaying your mortgage, try our Overpayment Calculator. For more information about 'Mortgage Overpayments', you can call us on 020 8783 1337 or submit an online quote.